Say goodbye to counter clutter forever with the Home Smart Power Dock! 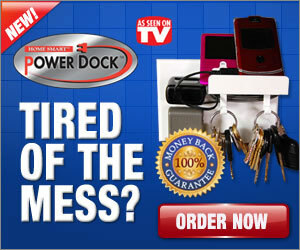 Power Dock works with your cellphones, PDA, GPS, MP3 Players, keys and more! With the Power Dock, you’ll receive 2 Power Dock Stations (Buy 1 Get 1 Free Offer), 2 free Power Dock clicp with built-in LED flashlight and a 30 day money back guaranteed. Use the Power Dock in any room! Kitchen, family room, foyer, bedroom, garage, game room or the office! Buy 1 Power Dock today and get 1 free!